It took the country's biggest car maker a long ride but it has hit a milestone. 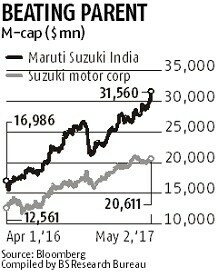 Listed in 2003, Maruti Suzuki's market capitalisation crossed Rs 200,000 crore on Tuesday, making it the 10th highest valued entity. Maruti has, for a while, been the highest valued domestic automobile company, ahead of Tata Motors and Mahindra & Mahindra. Two things helped the northward movement in its stock price. First came its annual and fourth quarter results on Thursday, when its share hit a new record of Rs 6,444 and the market cap inched closer to the Rs 2,00,000-crore mark. The company clocked a record profit of Rs 7,337 crore in FY17, about 37 per cent higher than the previous year. Year after year it has shown a volume growth higher than the average industry performance. In FY17, its volumes grew by almost 10 per cent, to 1.56 million vehicles, a 47.3 per cent share in the world's fifth-biggest car market. The second trigger came on Monday, when it announced its April sales volume. It dispatched a record 151,215 vehicles last month (including small export volumes), growing a little more than 19 per cent to the corresponding month of last year. The stock markets were closed on Monday and the stock reacted to this news on Tuesday, hitting a new high of Rs 6,730 and closing at Rs 6,705, up 2.8 per cent from the previous day at the BSE. The company was facing a capacity constraint, visible in the months of waiting period for its Baleno and Brezza models. This has seen some easing after parent Suzuki inaugurated its Gujarat factory. 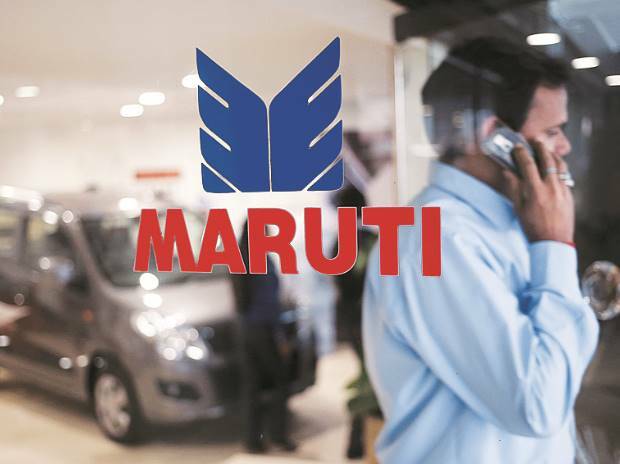 Maruti is again confident of a double-digit growth in annual volume and expects to do better than the industry, managing director and chief executive officer Kenichi Ayukawa said recently. Interest in the stock remains high. On Tuesday, a block purchase of about 44,000 shares was done for Rs 29.3 crore. The growth projections are triggering a new target price for the stock, which now trades at a price to earnings ratio of 29.95. ICICI Direct has given a 'Buy' call, with a target price of Rs 7,200 while HDFC Securities has one of Rs 7,070. That might help the company move up in the list of most valued domestic companies. At a Rs 202,564 crore market cap on Tuesday, it is closer to Infosys, ninth in the list with a Rs 2,11,548 crore market cap. 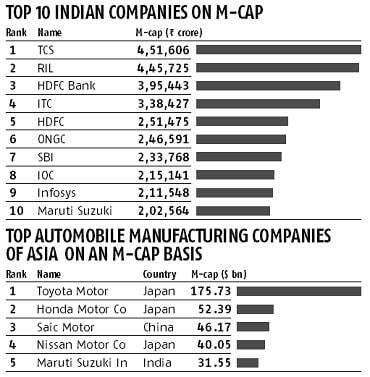 Maruti Suzuki, which commands a 53 per cent greater valuation to Japanese parent Suzuki, is now the fifth highest valued Asian automobile company — after Toyota Motor, Honda Motor, SAIC Motor and Nissan. SAIC is a Chinese entity; the others are Japanese.